Coverage: Live radio commentary on Radio 5 live sports extra plus live text coverage on selected matches on the BBC Sport website and app. 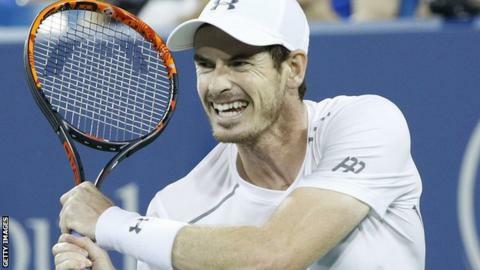 Olympic champion Andy Murray will meet Czech Lukas Rosol in the first round of the US Open, which starts on Monday. Murray, 29, beat Rosol 4-6 6-3 6-2 in a heated match at the 2015 Munich Open. British number eight Laura Robson set up a first-round match with fellow Briton Naomi Broady after a straight-sets win over Germany's Tatjana Maria in the final qualifying round. British number two Dan Evans faces American Rajeev Ram while Kyle Edmund will play France's Richard Gasquet. Johanna Konta, seeded a career-high 13th in the women's singles, meets American Bethanie Mattek-Sands, while Heather Watson plays Dutch qualifier Richel Hogenkamp. Top seed and world number one Novak Djokovic begins the defence of his men's title against world number 120 Jerzy Janowicz, while Spaniard Rafael Nadal, the 2010 and 2013 champion, meets Denis Istomin of Uzbekistan. Rosol, 31, shocked Nadal in the second round at Wimbledon in 2012. Olympic silver medallist Juan Martin del Potro has been drawn against fellow Argentine Diego Schwartzman. Women's world number one Serena Williams, a beaten semi-finalist last year, begins her campaign against Russian Ekaterina Makarova. Williams is aiming for a seventh US Open crown and a record 23rd Grand Slam singles title in the Open era. Murray, the second seed, said there is no ill feeling between him and Rosol after a dispute in Munich last year. "I have actually got along fine with him apart from that day and he's a tough, tough opponent," said Murray. "He's a big, strong guy, he goes for his shots and he takes a lot of risks. It's a tough opening round, for sure." Djokovic said he hopes to be close to full fitness for the start of the tournament, but admitted his left wrist has not healed fully. He first felt pain in his wrist in the week before the Rio Olympics, where he lost in the opening round to Del Potro. "I'm doing everything in my power to make sure that I'm as close to 100% as possible during the course of this tournament," said the 29-year-old. "I'm just hoping that when the tournament starts I'll be able to get as close to the maximum of executing my backhand shot as possible." Djokovic also said he was dealing with "private issues" when he lost to Sam Querrey in the third round at Wimbledon this year, but that those issues have now been resolved. He added: "I am in a position, like everybody else, like all of you. "We all have private issues and things that are more challenges than issues, more things that we have to encounter and overcome in order to evolve as a human being." "Rosol is the man who beat Rafael Nadal on Wimbledon's Centre Court in 2012, and was told by Murray that "nobody likes you" after the Czech bumped into him while changing ends at an event in Munich last year. "Murray could face Kei Nishikori in the last eight and Stan Wawrinka - or even Juan Martin del Potro - in the semi-finals, while chief rival Djokovic, still troubled by a left wrist injury, could play Marin Cilic and Rafael Nadal at the same stages. "It would be wrong to describe Djokovic as an unknown quantity at this US Open. He is the defending champion and has a sensational record on hard courts, but he has had an emotional few months after completing the career Grand Slam at Roland Garros."